Emma Bridgewater hand-decorated pottery is made in Stoke-on-Trent and the range includes a great selection of kitchenware and bakeware. The charming Polka Dot range features a colourful pattern that will bring a little bit of glamour to the kitchen! Also available is a range of half-pint mugs featuring beautiful flower designs from subtle snowdrops to splendid sunflowers, dancing daffodils to demure dahlias, magnificent marigolds to nimble narcissus, along with firm favourites like the terrific tulip, pretty pansy and beautiful bluebell. The Polka Dot range has everything you need in the kitchen for breakfast, dinner and tea! Egg cups and butter dishes for a boiled egg with soldiers, milk jugs and deep cereal bowls for plenty of your favourite breakfast cereal and 3 different sized plates for anything from toast to a Full English! There are also several different sized jugs in the range which are suitable for water, fruit juice, squash, milk and other drinks. Several sizes and shapes of plates and bowls are available to serve your food on including soup dishes for starters and fluted bowls for elegant presentations. The small ramekin is great for delicious desserts or serving sauces, chutneys or dips. Larger serving platters and salad bowls are perfect if you’re having a dinner party or buffet and you want to lay out an assortment of tempting treats and finger foods. The range also includes a utensil storage jar for your kitchen equipment and a 2 pint storage jar which is suitable for flour, sugar or even biscuits. If you enjoy a spot of afternoon tea, or just a cuppa at any time of day, Emma Bridgewater offers a wonderful selection of pottery for just such an occasion. Teapots for brewing tea in high style, either with the standard Polka Dot design or with Mr & Mrs hand-painted onto the pot – ideal for a wedding gift or anniversary present! The Emma Bridgewater range includes ½ pint mugs suitable for coffee or cup and saucer sets perfect for a cup of freshly brewed tea. The lidded sugar pot and ½ pint milk jug are great if you’re serving tea to a group of friends or guests. Storage jars will keep your coffee, tea and sugar fresh, ready for your next cup! If you’re serving a selection of sandwiches, scones, cakes or treats to your guests an Emma Bridgewater comport will display them beautifully. The Tea For Me set includes a teapot and a large mug which the teapot sits in when it’s not in use – a great gift for anyone you know who loves a hot drink! The Emma Bridgewater range of pottery will make a beautiful and practical addition to your kitchen. It is also a great range peruse if you’re looking for a gift for someone special, the 0.2 litre mug would make a great Christening present if you know someone with a different kind of new addition. The Mummy & Daddy ½ pint mugs will make a perfect little gift for any parent or the twin pack of Mr & Mrs 300ml mugs could make a suitable wedding, anniversary or Valentine’s Day gift, as would the aforementioned Mr & Mrs teapot. 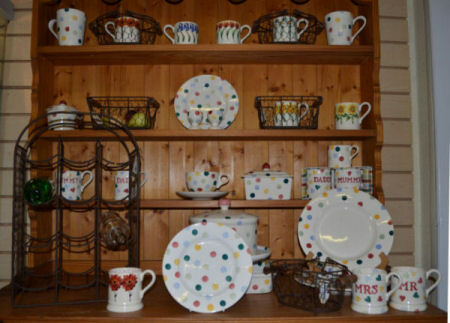 Emma Bridgewater, Mr & Mrs, Mummy & Daddy, Polka Dot. Bookmark.